We live in a botanical wonderland here in Western North Carolina. With a wide range of altitudes and relatively mild summers and winters, the region manages to support some of the greatest plant diversity on Earth. But as homeowners carefully decide which of the multitude of native and naturalized plants should grace their front yards, they often fail to consider selections that will provide menu options on top of visual beauty. Want a medium-sized tree to fill a sunny spot in the lawn? Go with crab apple. Or how about a some late-season color? Give Jerusalem artichokes a flower bed. The benefits are many. Landscaping for edibility brings the oft-used “eating local” maxim as close to home as possible. And for the most part, because native plants have developed in place for thousands of years, they can fend off pests and diseases and require little special care like pruning, spraying, and the like. That’s good news for organic gardeners as well as for cooks who want a steady supply of their favorite ingredients just outside their door. Getting started with edible landscape plants in WNC is as simple as analyzing the microclimates in the garden. Take note of your yard’s soil type, moisture, and sunlight. It’s sometimes a matter of deciding what treat you want to have on your seasonal menu, and finding the variation of that plant that can live under your available conditions. Here are six easy-to-grow edible plants—from fruits to roots—that will spark culinary inspiration every time you look out the window. BLUEBERRIES look gorgeous in every season: heavy with blossoms like alabaster bells in the spring, leafy green and laden with fruit in summer, crimson in the fall, then dusty pink and lovely against winter’s ice. Birds love them, bees love them, we all love blueberries for their flavor, texture, and nutritional value. Related to rhododendron and mountain laurel, blueberries prefer loose, crumbly soil, with a good slope for drainage and a bit of shade for part of the day. Plant them massed in rock gardens for maximum landscape effect, but close enough together that they can be covered with nets or cages when the fruit is ripening. And plant several varieties to assure cross-pollination. 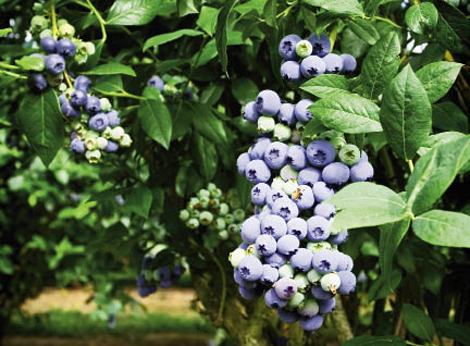 One great advantage of growing blueberries is their extreme cold-hardiness. For example, wild blueberries grow in profusion high upon Grandfather Mountain where little else thrives. Just pamper their shallow, delicate roots with light weeding and a thin layer of composted mulch. Mature blueberry bushes can produce many quarts of fruit, so get ready to freeze or dehydrate berries, can jam, press blueberry wine, make pancake syrup, or share with the neighbors. 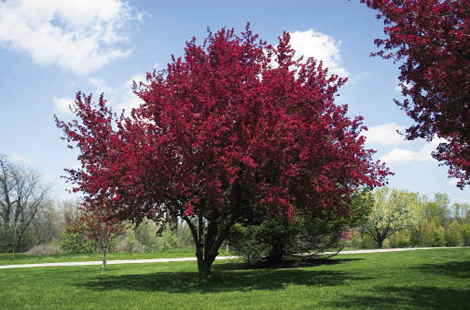 The strictly native CRAB APPLE has been nicknamed the Garland tree, perhaps for its sturdy, yet graceful and compact, form and its stupendous floral display during spring. The dark scaly bark adds winter interest to the garden, and don’t discount the fruit: crisp, juicy, and nutritious little apples with just enough tartness when prepared the right way. 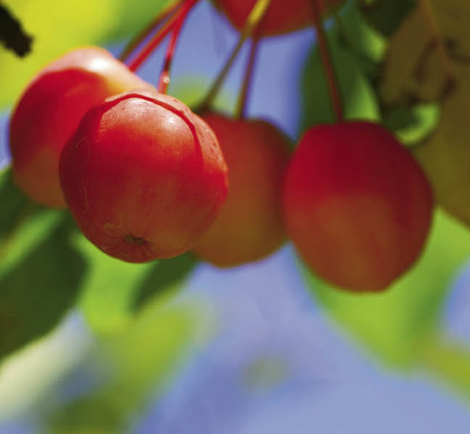 A reliable source of the sweetest crab apples fruits is the Callaway, which grows well in WNC. Plant two trees on your property for optimal pollination. They make for great focal points at the edge of the woods or in full sun by throwing colorful highlights into the landscape. Though they pack a sharp flavor in raw form, crab apples are much less harsh when cooked. Even the novice chef can make an expert crab apple jelly using fruit of the Callaway variety. Crab apples also offer loads of vitamin C and make a tasty glaze for roasted poultry and lamb, or a yummy addition to yogurt. Not an artichoke (nor does it hail from the Holy Land) the, JERUSALEM ARTICHOKE is really a member of the sunflower family, and it has the bright yellow petals to prove it. But it’s the pale, mild roots that have been eaten for untold centuries. 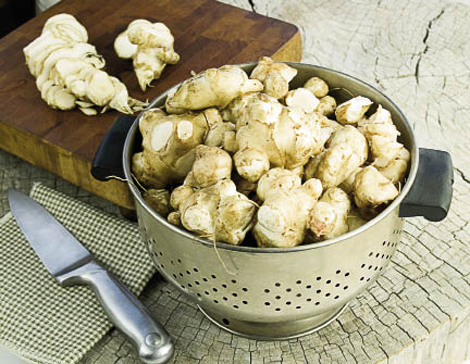 If you’ve ever wondered about the sunchokes in the grocery store, they are simply the roots of Jerusalem artichoke. They can be planted in the garden to start new plants or prepared in the kitchen. To cook, cut the root into strips before frying. It can also be boiled and mashed or eaten raw (though they should be washed, not peeled, to retain nutrition). Blooming from August until October, the North American native grows up to 10 feet tall, adding late-season color that attracts insects and birds into the yard. Goldfinches particularly like eating the ripening seeds and make quite a sight perched atop the flowers. Meanwhile, the roots are developing their nutritious starch reserves. Jerusalem artichokes like to spread. That’s great if you have a large patch of sunny ground to fill, but they’ll need to be kept under control so they don’t overrun neighboring plants. 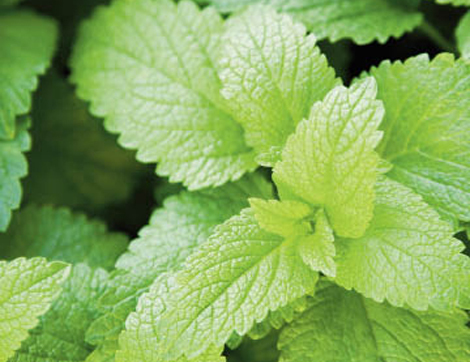 MINT gets a bad rap among gardeners, and for no other reason than it likes to run wild. True, if left untended it can form thick mats of stem and root that choke out other vegetation. But gardeners who have the discipline to nurture their mint can enjoy the plant’s many benefits. In the landscape, mint occupies wet and shady ground and bears pretty pastel flowers. And you’ll find no shortage of uses for it in the kitchen. Imaginative hybridizers have created thousands of mint varieties, but just a few species will do for culinary purposes. Wild mint (Mentha arvensis) is native, but spearmint (M. piperita) and water mint (M. spicata) also fare well in our region. The most beauty comes from bee balm, or Owsego tea (Monarda didyma), a less-invasive mint cousin that bears spectacular red flowers that attracts hummingbirds. The others should be planted in sunken boxes or pots, or behind barriers in the soil. Use mint for jelly, tea, juices, and syrups, or chop the leaves into tabouli salad and rice to be stuffed in cabbage rolls or grape leaves. They’re back! As the great Eastern forest receded in the face of timber harvesting followed by suburban sprawl, the native PAWPAW receded, too. Now, thanks to the efforts of pioneering pawpaw breeders, this small graceful tree is making a comeback. Sometimes called false banana or poor man’s banana, the soft, bean-shaped fruit—weighing up to a half pound—packs lots of tropical flavors. The custard-like pulp, can be used for breads, puddings, and ice cream. Because the fruit bruises easily and ships poorly, it’s not common in stores. Pawpaw trees need to be near forests to where they thrive on moist leaf litter and protection from sun by taller trees. They grow slowly, but eventually form thickets. The oval leaves are quite large and turn brilliant gold in the fall. The unusual small flowers are ornate and nearly brown. 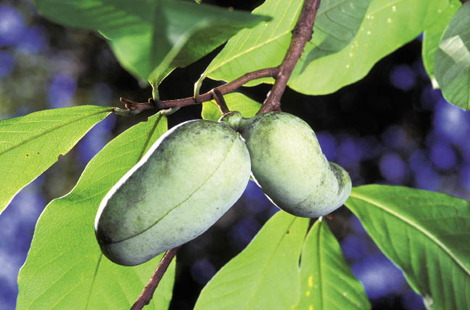 it’s best to plant at least two pawpaw varieties in proximity for pollination. With year-round landscape value and cooking qualities, the YUCCA has an outstanding presence that should earn it a place in any WNC garden. The naturalized wildflower yucca (Y. filamentosa) can withstand frigid temperatures and drying winds. And because it requires thin, fast-draining soil, it can work well as a flowing ground cover along the top edges of retaining walls. The yucca keeps its green color all year long, providing great winter interest against snow. And in early summer its flower stalks are amazing: six feet or taller, and covered in white blossoms. 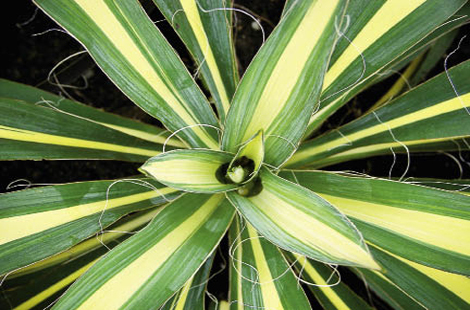 Curly filaments along the spiky leaves give the yucca a softer aesthetic. The blossoms are popular cuisine, both raw in salads and cooked with onions as a relish. And the pulpy fruit is edible, too, once the seeds are removed. The fibrous yucca root, cleaned and sliced, fries up fluffier and more flavorful than French fries—complemented nicely with spicy sauces—or can be mashed and then stuffed as a savory filling. Nan Chase will read from her new book, Eat Your Yard! Edible Trees, Shrubs, Vines, Herbs and Flowers for Your Landscape, on Sunday, March 14, at 3.p.m., at Malaprop’s Bookstore/Café in Asheville. Accent on Books, Asheville Sunday, March 21, 3 p.m.
Blue Ridge/Osondu Books, Waynesville, Saturday, June 5, 3 p.m.